What's new in the Windows 8.1 Store? The Windows Store gets a new look in Windows 8.1, designed to make it easier for you to find new and interesting apps. Instead of having to guess what the featured apps at the front of the Store do, a carousel flips through large images and descriptions of each of the six featured apps in turn (swipe down if you don't want to wait for it to flip). The new Picks for You section will be different for everyone because it's a mix of what's popular in the Store in categories you use, and apps liked by people who use the same apps you do. The list of new releases is no longer just a chronological list: it's tuned by Bing to favour apps that are higher quality or particularly interesting. Similarly, the Bing search that powers the list of popular apps will use machine learning and big data to pick trending apps rather than just the same old favourites. And you can still look at the top free and paid apps or dig into the categories – which are now relegated to the app bar. The information page for apps is much clearer, with big screenshots. You can see the ratings and reviews by scrolling instead of having to dig into tabs. And you can see a list of all the titles from the same publisher as well as another list of what Bing thinks you'll be interested in. There are more payment options: you'll be able to buy stored value cards for your Microsoft account – in real money denominations rather than as points – and spend those in the Windows Store, on Windows Phone and on Xbox. They'll be available in retail stores (if you need a lazy Christmas present) or as online codes, in 41 markets including the UK, US and Europe. That way you can set just how much children can spend on their account without having to authorise every single purchase. That matters more now that apps can offer in-app purchases for virtual goods, new levels, extra filters and other consumables. No more remembering to check the Store tile to see if you have updates (or keeping it pinned just to see when you have updates). Updates to apps will be installed automatically in Windows 8.1 unless you turn off updating (and it's either on or off, you can't set a couple of apps to stay on the older versions you happen to prefer and get everything else updated). If an app update needs different permissions from the version you have installed, the Store won't interrupt you to ask you to accept those before the update downloads. But if it's what Microsoft calls a "sensitive capability" like using your location, you'll see a prompt to allow or deny that next time you run the app so developers can't sneak that past you. One feature Microsoft has announced for the Windows Store that doesn't seem to be turned on yet: the option to install apps on more than five PCs. Although Microsoft told TechRadar there would be effectively no limits on the number of personal devices you could install an app on, when we tried to install apps on our test Windows 8.1 PC it told us that Microsoft account was already in use on five other PCs and we'd have to remove one first. Windows 8.1 will run Windows 8 Store apps. 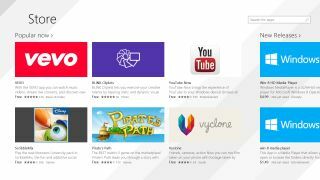 Microsoft is promising that means all Windows 8 Store apps by the time Windows 8.1 ships, although we're told to accept that some apps may not yet work in the preview. No word about being able to run the same app on Windows Phone Blue and Windows 8.1 either. Yes, devices are converging and Microsoft knows developers want to put the same app on more devices but we expect we'll have to wait until the next Windows Phone announcement later in the year.